I bet you can guess what it is, can't you? Its a pretty universal moment I have captured here. There is a sudden bad smell in church and my dad has leaned into my ear and whispered, "Did you pass gas?" There is a clenched teeth tone to his voice, either because he is angry or he is trying to only breathe through his mouth. 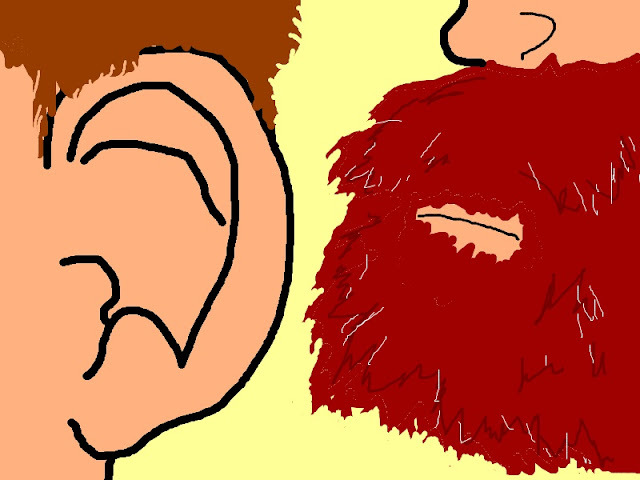 What the picture fails to portray is the tickle of his beard hairs on the outer edges of my ear. There were usually about a hundred people in church, but I guess the little boy sitting next to you is as good a fart culprit as anyone else. This blind kid I used to work with pronounced my name "Mutt". He had incredibly sharp hearing, and when you would think he was completely asleep, something would amuse him and he would burst out in a string of unhinged giggles. One of the few perks of working in special ed is you can pass the gas pretty much without restraint and the public at large always assumes its the students. With this kid, however, you could not even try it. I would try to barely, just barely, release a little discomfort, and he would hear it instantly. Out would come the giggles, and then "Excuse you Mutt-whooh" accompanied by some very exaggerated sniffing of the air. Pathetic as I am, if this situation unfolded in public, I would say "Who's Mutt?" and hope he did not raise a small crooked finger in my direction. Ha! This was great! Did you ever feel the need to make some kind of overt signal to those around you that you too were disgusted by the sound/smell? A face that said "Disgusting! Who or what caused such an awful assault to my senses?!" to those near enough to think it might be you. Even if it WAS your fault? I wouldn't know anything about that. Whatever happened to the "Whoever smelt it dealt it" rule anyways?